Beginning January 21: Support The NATO Defendants! 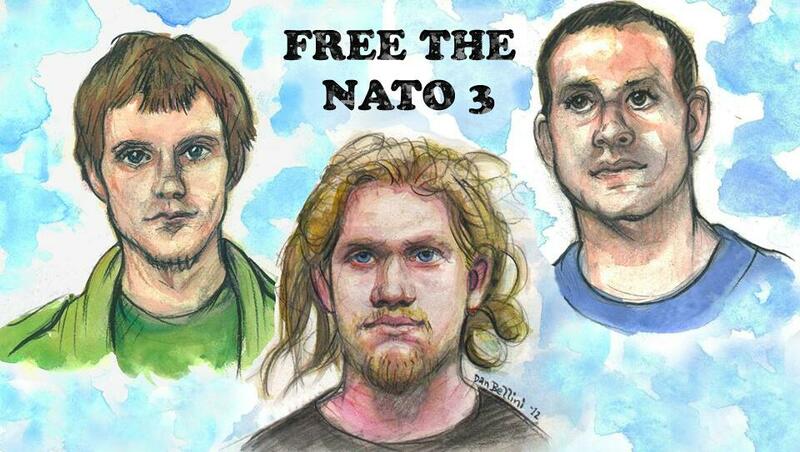 Support the NATO defendants -- trial begins January 21. UPDATE: Trial is now scheduled to begin on January 21 for the NATO defendants -- and they need our support. Few events in recent Chicago history showed the dangers of the national security state as vividly as the arrests of five young activists just before the May 2012 NATO conference in Chicago. To justify militarizing Chicago and clamping down on the freedom to protest, hysterical headlines about "terrorist plots" rang through the city just days before NATO officials -- the "biggest purveyors of violence in the world today" in Martin Luther King's words -- gathered in our city. Three of these activists -- Brian Jacob Church, Jared Chase and Brent Betterly -- finally go to trial on January 21, after 20 months in jail, many of them in solitary confinement. They face state ‘terrorism’ charges in a case built on trumped-up, politically motivated accusations -- and a ‘crime’ wholly created and instigated by undercover cops engaged in police entrapment. If you care about the dangerous growth of the national security state -- as evidenced by these arrests, sweeping NSA spying exposed by whistleblower Edward Snowden, the national campaign to destroy Occupy, and more – then make the time to personally attend the defendants’ trial. Don't let the NATO defendants stand alone! Don't let the prosecution railroad them as part of the larger government effort to steamroll our rights! Attend the trial and solidarity actions. 11 AM, Tuesday, January 21: Opening remarks, NATO defendants’ trial | 2600 S. California, Courtroom 303 (this may change, so watch for updates). Supporters are encouraged to gather an hour early outside the courthouse for solidarity actions on trial days. The judge in this case has imposed an extremely restrictive decorum order -- and has warned that any trial observer violating this order could be cited for contempt of court, which carries a large fine and possible jail time. Please take appropriate steps to ensure that you can participate as an observer in support of the defendants. Donate to the NATO 5 volunteer legal defense team!